The debate over vaccinations dates back to the turn of the century, when vaccination advocates and opponents expressed contentious viewpoints via the press, political cartoons, letters and organizations such as the Anti-Vaccination Society of America. Today, the debate has exponentially increased in momentum and visibility as everyone from stay-at-home moms to politicians turn to social media outlets to express their views on vaccine safety, efficacy and personal choice. We used the Cision Visible Intelligence platform to create targeted searches to surface social discussion about vaccinations. 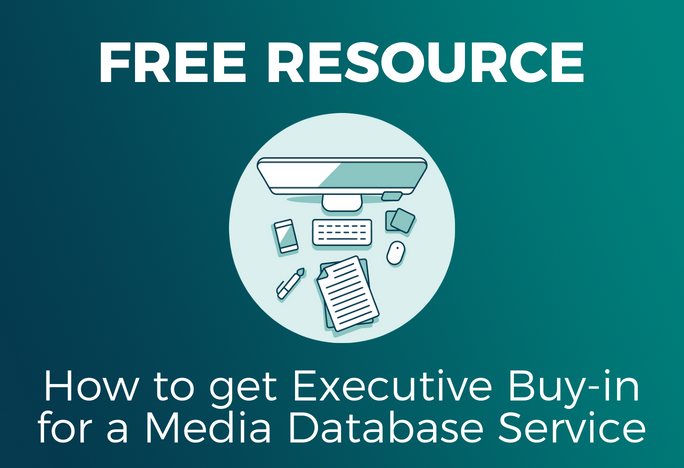 This data, combined with third-party analysis, provided insights into what people were saying and where they had their discussions. Over 100 cases of measles related to the Disneyland outbreak were reported in 14 states last month, adding fuel to the vaccination debate during recent weeks. With the 2016 presidential elections on the horizon, politicians from both sides of the aisle have experienced increasing pressure to weigh in on the controversy. Hillary Clinton, widely rumored to be the Democratic candidate in 2016, took to Twitter earlier this month in support of vaccinations. Many viewed Clinton’s tweet as a response to comments made by Republicans Chris Christie and Rand Paul, who expressed that vaccinations should be left to the discretion of parents. Sen. Paul also commented that he had personal knowledge of children who developed “profound mental disorders” (CNBC.com, Feb 2 2014) after vaccination. A vaccination debate quickly ignited on Twitter, with immunization advocates and dissenters using the hashtag #vaccineswork to voice varying viewpoints. Clinton emphasized her support of vaccinations as not only a politician but as a mother and grandmother, adding the hashtag #GrandmothersKnowBest to her pro-vaccination tweet. Pediatric vaccinations are top of mind for many parents. 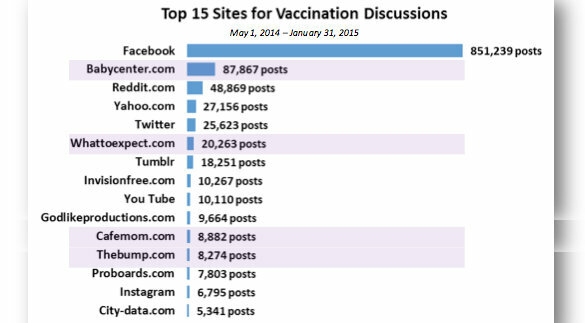 Of the top 15 social media sites where people are discussing vaccines, over 25 percent of those conversations take place on forums and online communities for mothers. 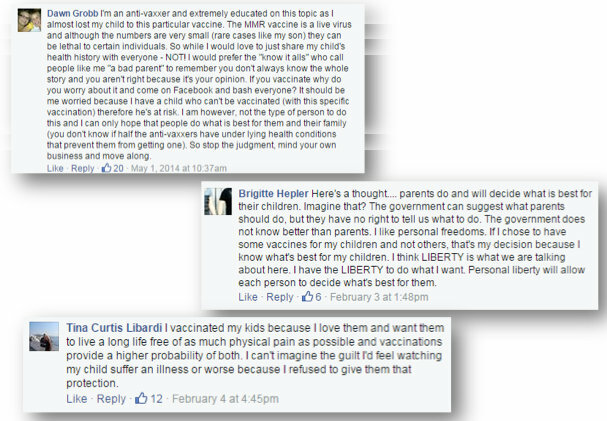 The topic of pediatric vaccinations is especially popular on Facebook, with many “pro-vaxxer” and “anti-vaxxer” moms engaging in heated debates via Facebook communities, comment sections and status updates. With a wealth of information only a few clicks away, turning to Google search for information about health concerns has become as common as seeking the advice of a personal physician. A new study published in The Journal of Advertising showed people were just as likely to be influenced by comments about vaccinations made by random, online commenters as by vaccination PSAs issued by the Centers for Disease Control. The vaccination debate has gone (excuse the pun) viral. 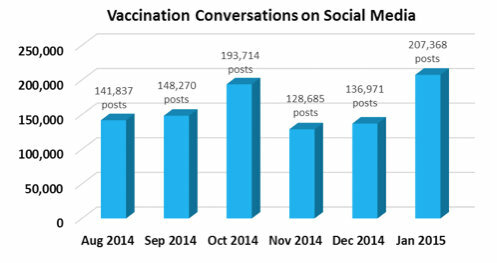 During the past six months, there were over 950,000 posts to social media sites discussing vaccines and vaccination-related controversies, with January averaging almost 7,000 posts a day on the topic. Where anti-vaccination groups once composed hymns to influence public opinion, both sides of the debate are now able to quickly disseminate a variety of information via Twitter, Facebook and online discussion forums. Ultimately, the vaccines debate is likely to continue to grow louder as political discussions, public health news and passionate opinions continue to be tweeted, shared and liked across social media. 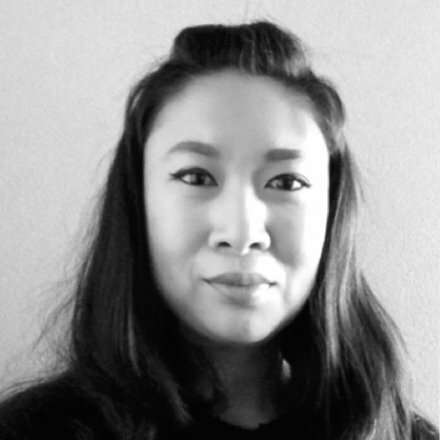 Gwynne Siak is a Research Analyst on the Insights Team. She is a subject matter expert in Social Analysis, and has worked with many leading global brands in the technology, pharmaceutical, CPG and hospitality industries, among others. Gwynne splits her time between the Pacific Northwest and the Southeast and is actively involved in the Seattle arts community.